One of the ways that the women in my family like to welcome a new baby is with a flannel swaddling blanket. 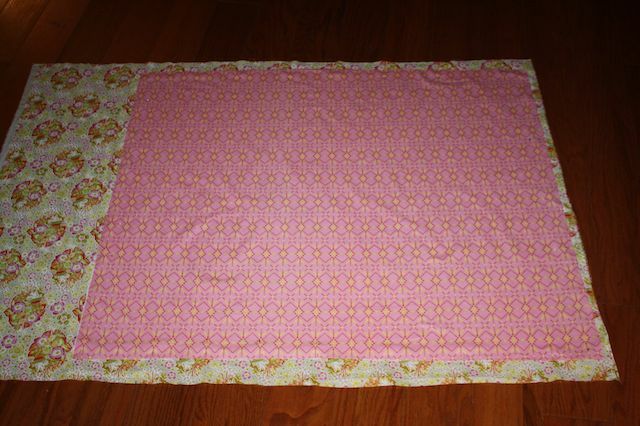 When my own babies were small, these oversized, handmade blankets were my very favorites. After Anna Maria Horner introduced her flannel and voile lines, I made this voile/flannel receiving blanket for a friend. And I fell in love. The weight of the blanket is just perfect. One side is so smooth and silky while the other is soft and buttery. I knew I wanted my baby wrapped in all that goodness. This time I decided to make one with bias binding, like the ones featured here. 1. 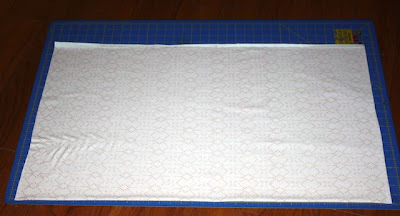 I started by squaring my flannel piece since the width of my flannel is shorter than the width of the voile. 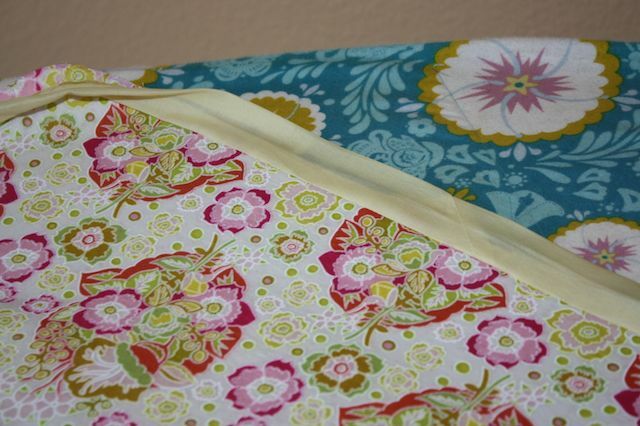 I find the easiest way to cut a larger piece of fabric is to fold it in half lengthwise, matching the selvage edges. 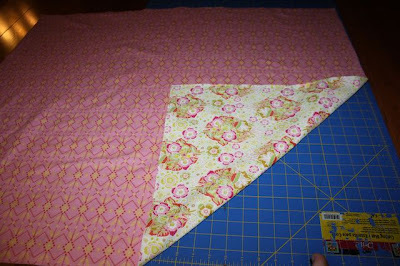 Square the sides that run perpendicular to the selvages. 2. 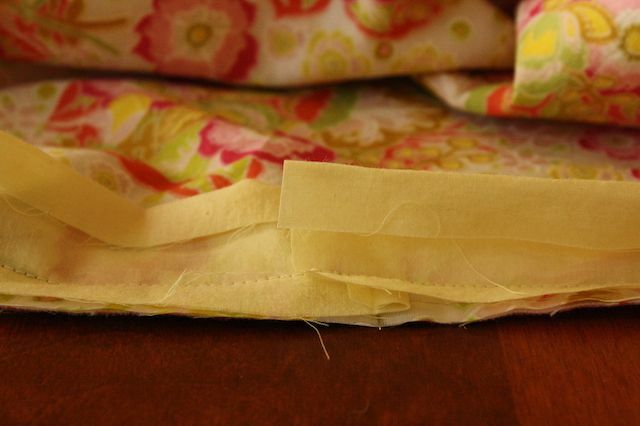 Then cut off the selvages. 4. 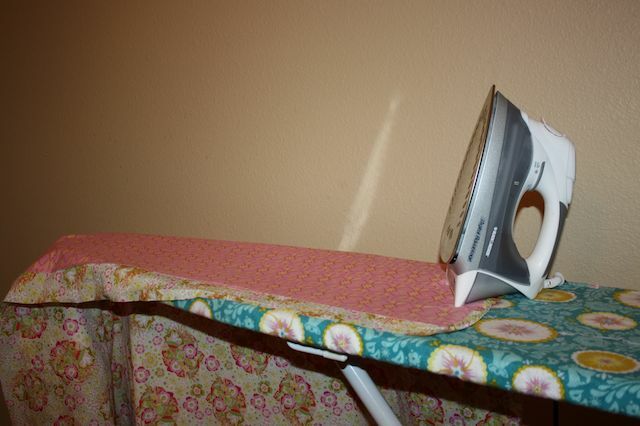 Smooth out any wrinkles as you go. 5. Baste the flannel and voile together. 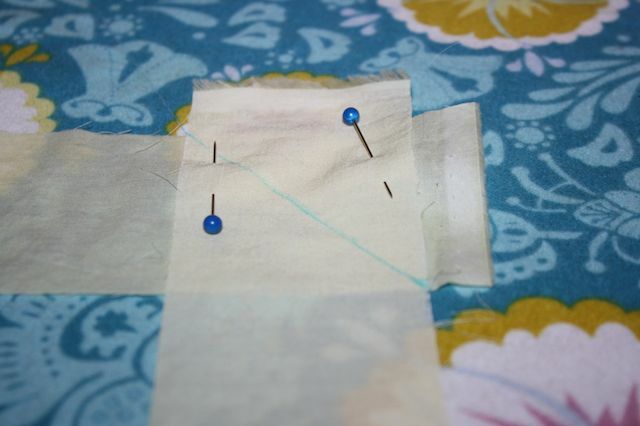 Then remove the pins. 6. 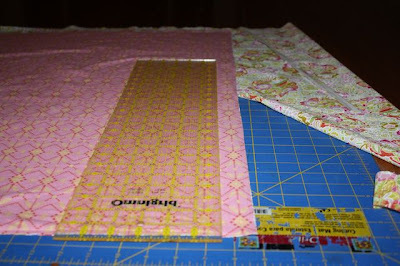 Cut away the excess voile fabric. Using a straight edge makes this step a breeze. Your blanket now looks like this. 7. 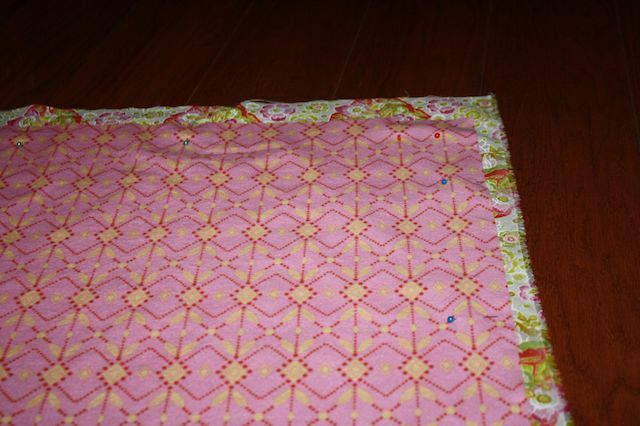 Because this blanket is bound with bias binding, you will need to round the edges. Use a large plate or lid as as template and trace the rounded corner. Cut along the line you just traced to make a rounded corner. Don't worry about re-basting the corners. Your other basting stitches will hold the corners together. You can now choose whether you would like to make your own bias binding or purchase your binding already made. 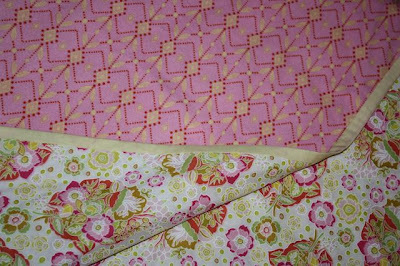 For this blanket, I much prefer the feel of the voile binding to the rougher texture of the binding you would find at the chain fabric stores. 1. When you make your bias binding, you need to cut your fabric on the 45 degree bias. There is a tutorial on how to do that here. Since I had only 1/2 yard of voile fabric, I cut my binding on the crossgrain to do less joining. Doing this caused my corners to cup up ever-so-slightly. I found notching and trimming the corners helped a lot with this. 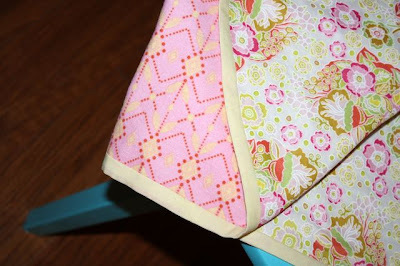 For the nicest corners, cut your binding strips on the bias. 2. 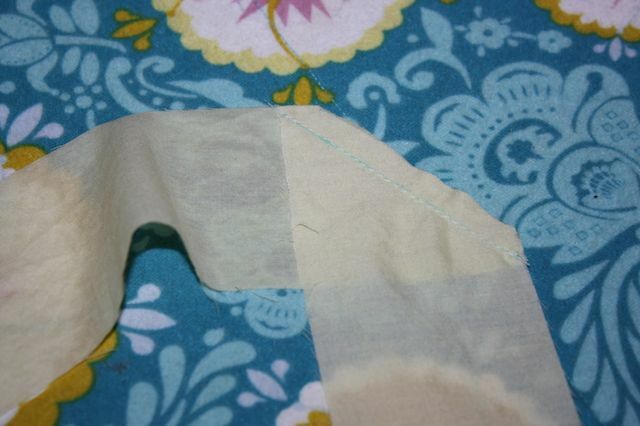 Overlap your binding strips right sides together so that they are perpendicular to one another. Stitch at a 45 degree angle. 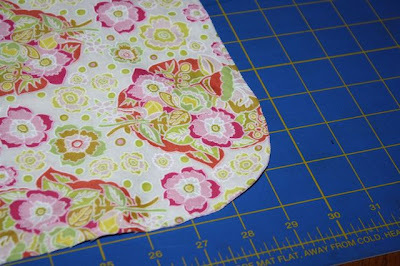 Trim the seam allowance to 1/4". 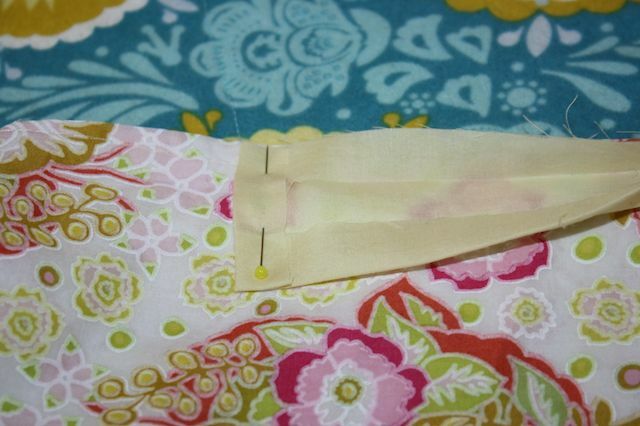 Tip: If your binding strips are the same color on the right and wrong side, be sure to designate one side as the right side as you join your strips together. 3. 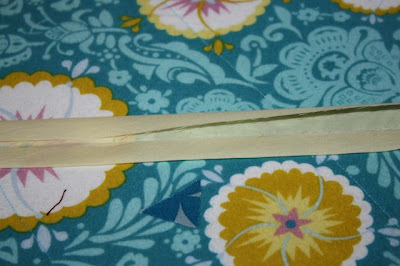 Now that you've joined your strips together, fold them in half and press so that one side is 1-2 mm longer than the other side. 4. You will now have a crease in the middle of your long strip, with one side slightly wider than the other. 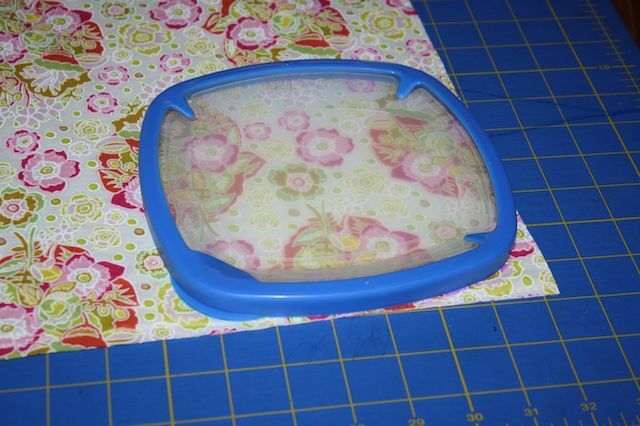 Press the left and right sides in toward the center crease. 5. Now that your left and right sides are pressed inward, fold again along your original middle crease and press. One of the folded sides will be slightly wider than the other. This is what we want. 1. Unfold the narrower side of your bias binding open. 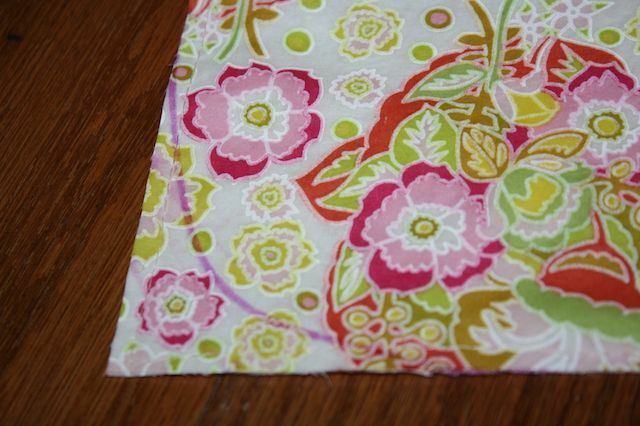 Fold in the end about 1/4". 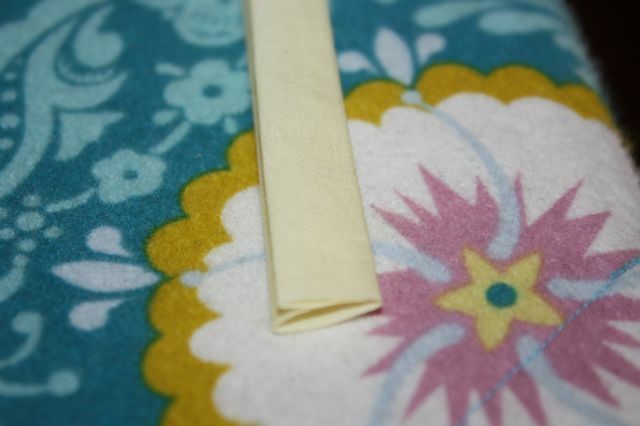 Line up the edge of the binding with the edge of your blanket. 2. Sew the binding to the blanket in (or just to the right of) the crease. 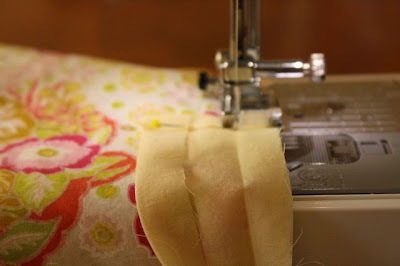 Tip: Make sure you change your stitch length from the longer basting stitch we used earlier to your normal stitch length. 3. 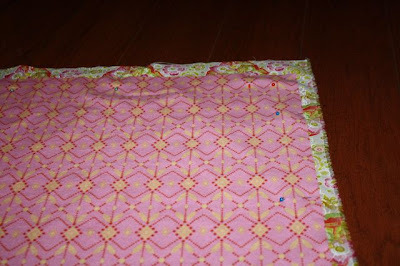 Continue sewing around your blanket until you reach your starting place. 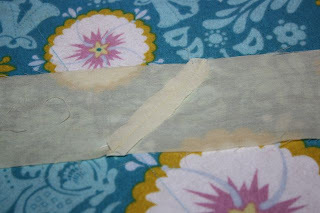 Then overlap your binding strips by 1/4-1/2". 4. Using the tip of your iron, press the binding away from the blanket toward the seam allowance. 5. 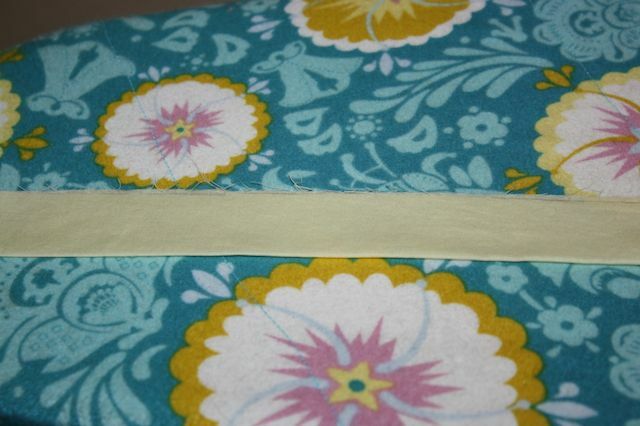 Then wrap the binding around to the other side of the blanket and press. Option 1. 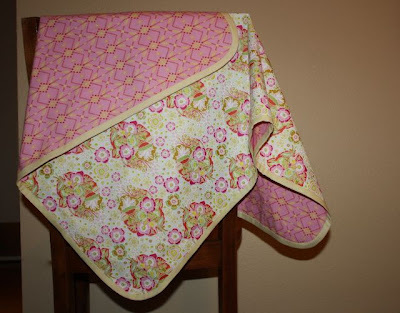 You can machine sew your binding to the back of your blanket. Make sure your binding covers the stitching line. (If you're using homemade binding, which may be less stiff than the traditional store-bought version, you might want to pin it just over the stitching line before you sew). Edgestitch the binding from the front of the blanket, about 1/8" inside the binding seam. Option 2. 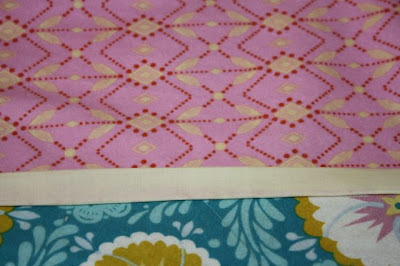 You can hand sew your binding to the flannel side of your blanket. 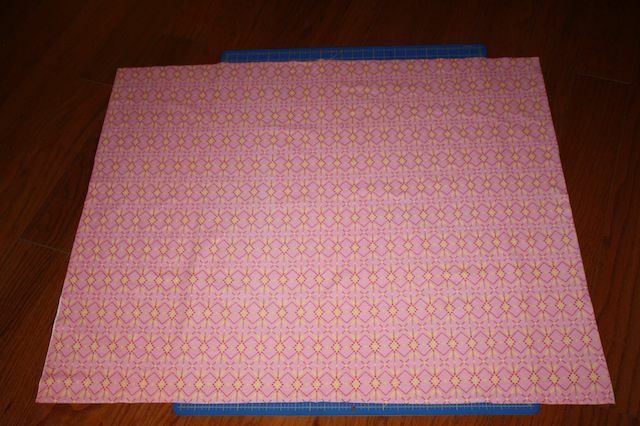 This way, you will not see any stitching on your blanket. This is the option that I chose. I used this stitch, being very careful to only catch the flannel side of my blanket, so that my stitches did not show through to the voile side. Your blanket is finished! 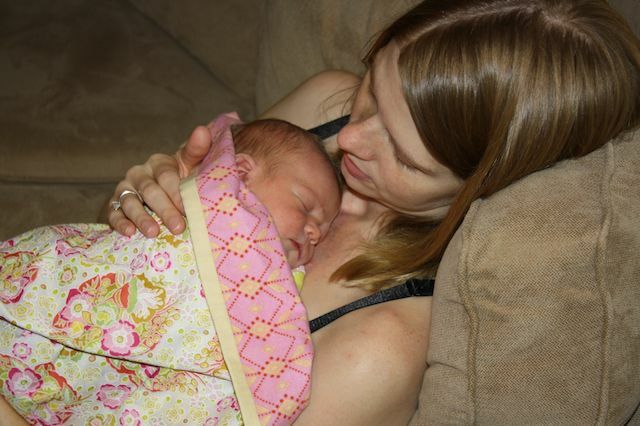 You will now make one sweet baby (and mama!) very happy.